Welcome to the new look monthly newsletter from Lenscraft. This newsletter already receives a lot of positive feedback from readers. But I’m not satisfied. I want it to create something of such of such quality and value that you can’t believe I give it away. If you can think of improvements you would like to see, let me know. I would be delighted to hear from you. I hope you like the new format this month and please feel free to share it. I’m going to start the newsletter with a favourite image. This time its one I shot at the start of this week in Blackpool. Photography is all about light. It’s about recognising when it’s wonderful but also about how best to capture that and translate it into an image. The reason I like this image so much is that the light was perfect. There was the warm, low winter sun reflecting off the pier, which in turn is set against the dark storm clouds. I hope you like it. In last month’s newsletter, I asked for your help feeding back on my idea to develop free learning packs to support camera clubs. There was an excellent response to this, running into three figures. I’m very grateful for the time and thought people showed in completing the survey and I would like to share a summary of the responses. 75% of respondents were members of camera clubs or societies. Of the 75% who are members, 100% thought the idea was a good one and could be used by their club. There was lots of helpful information added and it appears many clubs have training nights where the packs would be valuable. Of the non-club respondents, 75% thought there would be value for them in the suggested packs whilst 25% were undecided. Most respondents thought the pack should included written instruction, an example image to work with and a video demonstration. Only a small minority though a quiz would be useful. The most popular topics suggested were Photoshop, Lightroom, Nik and (a little surprisingly) On 1. Based on the responses, I will be developing several learning packs for use by clubs, societies or any of the Lenscraft Members. These will include an example high resolution image, written instruction and a demonstration video. It will be a couple of months before the first of these is ready, but there will be announcements in future newsletters as they become available. This month I’ve been trawling around the internet looking at a few photography sites and the following have all caught my attention. I hope you like them and don’t mind me sneaking a few of my own in there. Some people love Peter Lik and others don’t. Whatever your opinion, his work is striking. What seems to cause the most contention though is the claim in his galleries that his work is shot with conventional cameras and not manipulated. Look at this video critique by the FStoppers team. I found it fun to pause the video at the start to make my own list of points as to why I thought the image was manipulated or not. I’ve been hard at work posting lots of new You Tube videos this last month. My aim is to release a new video each week. Here’s a link to the channel. If you subscribe to the channel (it’s still free) you can see when I release new videos. Here’s a link to subscribe and see the latest videos. Want to see some inspirational photography? I came across the work of Jan Bainar recently. Amazing is about the only word to describe his images. This is a nice tour of the Fuji factory, watching them hand build lenses. Amazing levels of cleanliness on the shop floor as well. At the bottom of the article there’s a link to other factory tours. Be sure to contrast it to the Hasselblad pictures. It makes you realise the levels of cleanliness Fuji go to in their factory. A few years back I subscribed to “Camera Craft” magazine. Recently the publisher emailed a link to read the magazine online for free. It’s a good magazine with some interesting articles. But better still, look further down the page you see other magazines you can read. 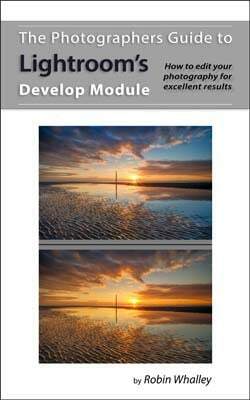 My latest book “The Photographers Guide to Lightroom’s Develop Module” launched on Amazon last week. It’s had good sales for which I would like to thank you all. Many of you have enquired about both PDF and Print copies of the book. I’m currently working on these and expect to have them ready for publication for next weekend. The PDF version will be available in my Lenscraft Creative store as well as Google Play and the Apple iBook store. I will send out an email with details once the book is available. I hope you enjoyed the new format of the newsletter. The next Newsletter is published on the first Saturday of April.